Recently Interpine Forestry and another innovative consultancy company VTS (Value Tech Services*) have joined together in a joint venture to position a staff member in the USA. Interpine / VTS* is a joint venture company that shows a history of credibility in the forest industries of New Zealand and the Pacific Rim. Our proposals are uniquely tailored to meet individual client needs. As true believers in good communication, we work closely with our clients to build successful working relationships, while attaining optimum results using unique, state of the art forestry technology. This further follows up work that Interpine has done within the Pacific-Northwest Forests of Oregon and Idaho (see news article USA-1200). The employee Craig Penfold (Interpine Project Manager) will have the role of promoting our services to the American Forest Industry. Craig worked with Interpine in 1998-1999 and rejoined the fold in May this year. He returns from work with one of New Zealand’s forestry coperates as a production planner and systems analyst. His partner Lauren is also traveling with him. Value Tech Services (VTS)*/Interpine Forestry (IPF) North America is a joint venture project between two independently owned and operated companies that specialize in maximizing the potential value of forest products (log grades) from the “standing resource to customer value supply chain”. 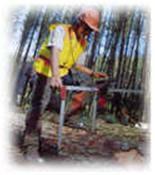 Through our experience of using intensive supply chain management systems and by applying optimizing technology to the standing forest at the pre-harvest and harvesting fronts we offer a range of services from log-bucking decision improvement, to extensive forest product differentiation and log grading strategies. VTS/IPF North America place emphasis on the optimum value of the standing forest resource and use technological systems to ensure that the optimum value is continually recovered while understanding how subsequent decisions, market influences, and harvest processes have either helped recover or lose potential value. We do this by intense, real time measurement of the value leakage points within the “standing resource to customer supply chain” and provide solutions that minimize this value loss by promoting and recovering optimal value at all times. VTS/IPF North America can provide consulting, operational, manufacturing and data management services to forest growers, stumpage buyers, sawmillers and harvesting contractors within North America. We stand by and believe in our systems to the extent where many of our projects and supply chain improvement investigations are based on a “payment by results”, agreement where we receive a certain percentage of the proven value gain. “Improving our client’s baseline profit by demonstrating management systems that are cost effective and forward thinking. Provide clients with improvement systems that demonstrate the value of the information is worth more than the cost of getting it. Demonstrating supply chain improvement tools and systems that are applicable toNorth American based operations and organizations, with regard to the present and future direction of their supply chain planning. Provide an efficient service with dependable backup and creditable support systems. Remaining open minded and flexible in applying systems that differ from region to region and resource to resource. Boise Cascade Corporation* have actively been evaluating how to improve the building products and value yield from our timberlands in the Pacific Northwest. Interpine Forestry Limited a company well known to me during my twenty-five year career in New Zealand has been integrally involved in this improvement process. BCC are very confident that many components of Interpine’s very innovative timber inventory, log grade optimization technologies, and supply chain management information systems can add value to our businesses. However making this a reality will now depend to some extent on Interpine’s establishment of a US business base beyond just BCC. Thus I sincerely hope that your company will also take the time to evaluate Interpine’s technologies and value chain improvement systems. * due to the nature of the Internet we cannot guarantee links outside of our website – we will however attempt to ensure they are kept up to date. You can notify us of link problems via our feedback form.